Friday, Feb 19 - 5:30AM to 5:30PM - $170.00 - 16 Sells Out (Warning: Swinging For The Fence Increases Odds Of A Strikeout..) . Saturday looks too windy to get offshore comfortably on my boat. Now Out Of Block - Rats! Working On More.. (Have a little MONEY now - that helps!) Will Accept Even Small Donations Of A Few Blocks You Have Cluttering Up The Yard.. The tire reefs of the 1970s were 95% mosquito control & just 5% "good for fishing." Maybe it was 90/10. If you think there was genuine concern for recreational fishing, you've not been following along.. 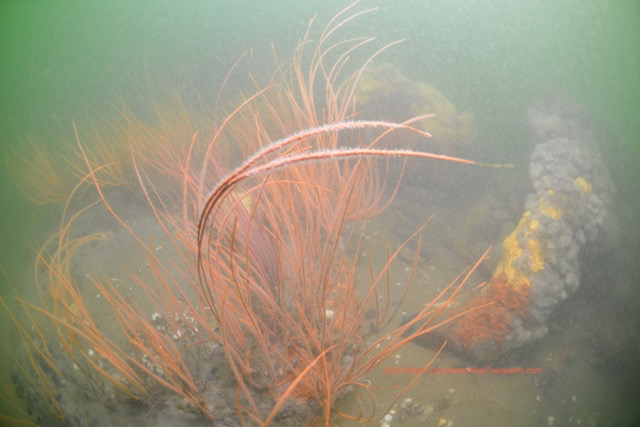 This pic & others from 8 miles off MD's coast show how if there had been more effort to engineer tire reefs to stay put, to resist wave energy and NOT BREAK APART, coral growth on them would have been amazing. Unfortunately, tires are STILL washing ashore..
No - I do not want to go back to using tires. The anger & resentment poorly engineered reefs have caused, however, are what prevent logic from becoming part of an argument for increasing marine productivity by building artificial reef. Only a substrate is artificial: all growth & fish occur via natural colonization & spawning as if a storm had swept the sand from a patch of rocky bottom. When a hard substrate is exposed, whether we put it there or shifting sands revealed it, nature leaps at the chance to thrive. Because so much of our natural reef bottoms were clay or soft sandstone, one could reasonably argue had it not been for horrific shipwrecks---completely uncleaned & 'unprepared for reefing' catastrophic losses prior to artificial reef building; entire fisheries would have been lost as impacts to natural hardbottom reefs increased after WWII & into the 1970s. As more & more bottom was lost--forever; wrecks & then artificial reefs became habitat's backbone . . . . Nothing like a little reef-rant to get the blood flowing. Wes, Danny & I just did 3 days at the Ocean City Boat Show's OCRF booth. Dern near talked ourselves horse. Two-Drop Terry stopped by to help a couple hours. Probably felt guilty for eradicating so many fluke last summer. Lots & lots of folks stopped by to say how they appreciate what we're doing, and then helped OCRF do still-more with a contribution. Because of that enormous gale a few weeks ago, the blizzard some call "Winter Storm Jonas," a lot of trash washed up on the beach, including tires from reef building back in the 1970s I discuss above. There have been mistakes made in selecting reef building material, no doubt. But even mistakes in reefing have added more to marine production than ignorance. NOAA & NMFS have yet to recognize any type of growth, or any area of growth, anywhere in the shelf-waters of the Mid-Atlantic, as Essential Fish Habitat. These temperate corals I've videoed & shown pictures of for almost two decades have not been studied -- at all. That orange soft coral, the sea whip you'll often see in pictures I send - that's NOT fish habitat. Not according to .guv anyway.. Actual fish seem to like it pretty swell. Hard February. Was looking like a mild winter back in December into January.. Did sneak a single tog trip so far in February. That day a fellow caught a double right out of the gate. One was about 8 or 9 pounds & was sporting an ALS tag we'd put in some time ago. That fish was released. The other was a thick, bull-headed rascal of about 17 pounds that went home for dinner.. Some pretty fish caught. Others got away plain as day. Some skunks. It's the hardest bottom fishing I know of -- in the hardest time of year. Did I mention we saw a right whale a few weeks ago? Reported it - but didn't get a pic. There's only about 400 left. Researchers know each one. Funny coincidence.. Regulators long ago, early in the era of whaling thought "whales are moving north" - up to the ice - to move away from the hunters. Of course, those whales 'up north' had been there all along. This new absence of whales where hunting had been unrelenting was simply the effect of harvest. The presence of whales where no one had yet hunted meant just that - virgin habitat. When we had a croaker kill 15 years ago or so, MD DNR said: "A pocket of cold water stunned the fish." Their argument from authority was soon joined by a more plausible bit of work from the Virginia Institute of Marine Science (VIMS) who, through testing, had found an infection was raging in the croaker population. ..even though Georgia and both coasts of Florida are catching cbass to this day. A genetic study showing separate/isolated populations has been grasped like a life-ring by NOAA to show how our sea bass must have developed an affinity for cooler water than those far to our south in much warmer water. Sea bass are a poster child for funding climate science in fisheries - star in a paper called Climate Velocity where sea bass populations shifted FAST. "Yeah! Climate Change Did It!" This other new guy on the block, regulation, couldn't have anything to do with it. They can tell because catch bounces around regardless regulation's influence ..and catch is made plain on computers using MRIP's catch estimates. Simple plausibility, even if complete fable, always precedes true understanding. The philosopher Kant urged thinkers: Sapere Aude, which loosely translates: Have The Courage To Use Your Own Reasoning. In Fisheries, long use of bad catch estimates has made such a mess of rational scientific expectation from regulation that courage is in short supply. For instance, in this article we see Rhode Island anglers will be allowed 8 flounder & 3 sea bass. What a strange, strange place regulation has come to when such as that could ever be a consideration. What this regulatory pairing shows is how far from biological realities bad catch estimates can take us. Then too, why in the world aren't our temperate corals, in any collection, considered fish habitat? Why are these places, so very well-known to hold reef-fish for nearly every life stage, completely ignored in all attempts of "fishery restoration" in the Mid-Atlantic? I think seafloor habitat has been ignored because regulators see catch & populations jumping around like grasshoppers on hot pavement. With swings such as are represented in the MRFSS/MRIP catch estimates, habitat seems a small influence - if any influence on populations at all. At this stage--where we are today, warming pushes cold ice melt waters south along the NE & Mid-Atlantic coast via the Labrador Current. How, I wonder, did we come to a place in 'science' where global warming is blamed for our warmest-water reef fish "moving north" while cool-water tautog remain firmly rooted; and a far-colder water species, Atlantic cod, begin returning south to long abandoned habitat, the exact habitat sea bass are said to be 'abandoning' because they've grown too warm.. I think the correct understanding of sea bass population shift north in the Mid-Atlantic--and it has shifted--should be seen as an effect of management only diminishing populations in the southern/central Mid-Atlantic. This 'shift north' is not at all applicable to warming because bottom temps are as cool or cooler over the last 20 years. However, the very shallow & rocky area just below Cape Cod, which is trapping warm surface waters blown in by summer southerlies, has indeed seen an elevation of 10 to 12 degrees fahrenheit in summer. That warmer, rocky-reef area has increasing sea bass numbers. An area without any recreational sea bass fishery during regulations' dawning -1997- and remained without in those years when their size limit was 12 & 13 inches, now has sea bass flourishing with a 14 inch limit. But we couldn't call it a "Fishery Restoration" because 'fishery' describes the human side, describes human use of a fish population. For instance: every fall I used to have clients from Massachusetts flee their scup to come fish off Maryland's coast for unlimited sea bass. Many of those clients from up north stopped coming for the fall cbass run immediately after the 25 fish limit was enacted in 2002. Therefore, it's unlikely anyone following the letter of the law will be going north to fish for sea bass with Rhode Island's 3 fish limit, or MA's 8 fish. Although the region now has enough cbass to create a legal fishery, sea bass remain primarily a bycatch in the scup fishery even if targeted by some with artificial lures. Regulations based on impossible assertions of catch which allow only small bag limits do not restore a fishery - they choke it to death. (I should remind readers that the period from 1992 to 2001, a time with no recreational bag limit on sea bass, was also a time when the population doubled many times -- sea bass fishing got better & better until we went to a 12 inch size limit. Unforeseen by anyone, that size limit increase shifted the age when we first see the blue "nuchal hump" on male sea bass - what we call a 'knot head.' Apparently driven only by what size cbass they see around them, cbass now spawn years later than they used to. In all of 2015 I saw one sea bass under 9 inches with a blue head. We used to see hundreds every day..
Of far greater immediate consequence than warming: the greening of the Mid-Atlantic ocean escapes notice, while convenient (yet illogical) inventions of fish population movement garner headlines. Our "Deep Blue Sea" is turning green - has turned green. NOAA: "OMG - would you look at that temperature??" I too have been guilty of grasping at convenience. When our sea bass population began to tumble in 2003/2004 there was an incredible by-catch of sea bass in Feb/March/April 2004 in the just-loosening summer flounder commercial trawl fishery. I've heard numerous stories from guys in the fishery--even of many boxes marked 'squid' that maybe weren't--but heard on my radio, in my wheelhouse, as trawl skippers begged anyone who had a sea bass permit to come get his bycatch lest his crew shovel them over dead. One captain was literally begging.. In good weather, trap boats & conch boats with a permit (who hadn't set any sea bass gear for the season at all) were "catching" sea bass like crazy. In bad weather & on trawlers more willing to accept the realities of regulation; well, those sea bass just got shoveled back dead. I'd predicted such an event in my 11/07/03 fish report in a comment on sea bass management I'd submitted to NOAA about their need to use habitat fidelity in quota management. "If a subset of a coastal stock were targeted, though unintentional, with heavy pressure, then fishers on that stock in the other parts of the year would see greatly reduced landings." Six months later, in May of 2004, my clients caught just a touch better than half the sea bass they'd caught the year before. I thought then the sea bass population would quickly correct. After all, I'd just witnessed year after year of population doubling. ..but they didn't. Still haven't. Then I thought it must be madly increased recreational discard mortality that was causing our sea bass diminishment. In all our thousands of tags I had noticed how larger sea bass always seemed to have greater difficulty than sub-10 inch fish at release. I continue to think larger sea bass have greater difficulty with release; but it certainly isn't the cause of our region's sea bass dropping back to pre-regulatory populations. Very little fishing occurs where depth would play any role. On my boat we have it dialed in to where release mortality is much, much less than 1%..
Oddly enough, today there are probably more large female sea bass off our coast than ever in history, yet those Big Old Fecund Females (BOFF) create the least amount of sea bass production in history too. Sea bass production tanked in the central & lower Mid-Atlantic right the heart of this grand experiment called 'fishery restoration.' The easiest plausible idea to offer Congress & the public is "climate change".. Yes - ice is melting. Big time. It's warmer. What I believe is a well-known current, the Labrador Current, is carrying ice melt cooled waters south. I believe scuba divers who tell me it's chilly down there. I believe cod, true Atlantic cod (and not 'ling cod' which is a whole 'nother story..) are more numerous than ever in my 36 year career, while amberjack & spadefish are fewer. I'll tell any who will listen: our troubles with sea bass lie in spawning production and not from water that's suddenly too warm. . . . .
One last-minute survey by NOAA showed sea bass & reefs. NOAA has no issues with wind power. OK good. Wind power's good. The windmills I've heard & felt, however, will be as welcome as a kid on either side of you at a redlight having a bass speaker contest. Those big blades rotating ain't like a Walmart fan. It's a deep rumble that vibrates to your core. Whether they'll be pleasant to fish around, or even if we'd be allowed to fish around them; we do need to move forward with renewable energy. Windmills! Suddenly there was money for ocean work and lots of meetings. I told all these agencies, "Hey, there's coral off here. It's where we fish." They seemed to say, "We hear you." Then, later, I told 'em about how survey boats are a big pain in the neck because they turn the bite off. At a meeting a couple years back it was a funny story - they laughed. Humor, unfortunately, proved a poor teaching aid. ...If what happened to reef fish happened to piping plovers or spotted owls or any kind of marine mammal - law suits would be flying. When Maryland's R/V Kehrin was doing survey work for the Maryland Artificial Reef Initiative (MARI) prior to deployment of NYCTA cars at Jackspot Reef in, I believe, May 2007; Capt. Rick Younger did not seem surprised in the least that his sub-bottom profiler had the instantaneous effect of shutting off what-was a magnificent sea bass bite. The Kehrin's sub-bottom profiler unit was turned on just several hundred yards from my boat. It positively & instantaneously shut-off the feeding of sea bass. Capt. Younger, of course, turned his unit off when asked. The fish resumed feeding. I went and filmed several reefs impacted by survey boats in September of 2015. The effect surveys had is plainly cumulative & catastrophic. I made a 4 minute video and released it a few weeks ago - https://www.youtube.com/watch?v=46ahNqo8geE .. We were late getting out there to film. Really late editing it.. Do have to make a living. Weeks after the survey boat was finished--had left for survey work elsewhere, there remained no sea bass on reefs in & near the Maryland Wind Energy Area..
Last year, in 2015, we had no spring run of sea bass. I'd never seen such a thing. Used to be I would presell all of May starting in the first week of December. (e.g. If you wanted to book a Saturday spot in May right now, in February, fugedaboutit - All Sold Out.) Sea bass fishing was great & clients knew it. Now I'll open the last two weeks of May sometime next month and warn clients it won't be what we used to have. Having thought long & hard, I attributed the 2015 spring run failure to there being so few spawning sea bass that any impetus--any race among them to be first to claim the best spawning spots--is now gone. But I wonder if instead year after year of surveys has taught our sea bass NOT to spawn here, not at all.. Spawning site fidelity is everywhere in the animal world. Similar to salmon, sea bass return to exactly the same spot to spawn. Except, unlike salmon, sea bass survive to spawn again & again. (if we don't catch them!) We've shown spawning site fidelity in cbass with tags hundreds of times. What's going to happen now that we've forced them --year after year by sub-bottom profiler noise impacts-- to leave the only spawning ground they know? I think what's going to happen is all that bottom in the Maryland Wind Energy Area (MD WEA) will become as if it were a brand new artificial reef - a huge new reef spread out in fantastically greater area than we could ever hope to permit for reef building ..with no fish on it. With it's previous spawning population having vacated the premises over what I calculate to be about 500 square miles of seafloor; a new spawning population will take a while to rebuild. BOEM sez: Nothing to see, No Effect From Survey Equipment AT ALL. Fish can not even HEAR it. Move along now. Oh, by the way, we'd like to use a more powerful survey equipment, equipment we actually admit does affect marine mammals & fish for oil exploration. You won't mind, will you? There are very, very few who feel any real effect when Big Dot.Guv screws-up in the ocean. Unless it washes up on the beach; who's to know? I'll tell all who will listen - this business is bad getting worse. All of it. NOAA tells Congress sea bass are 'restored' ..yet I anticipate the worst spring run in the history of evers, and still another summer with fewer sea bass caught across months than we used to catch in a day. Hey Big Dot.Guv, I think you're screwing this fishery restoration/habitat thing up big-time..
Lots of people, townships & municipalities are fighting the idea of oil wells off our coast -- beginning with oil surveys. Coastal residents feel safe from oil spill without oil platforms off our coast ..but we have huge oil tankers, bigger than the Exxon Valdez, off our coast all the time. They feed crude to refineries in Philly & Delaware along the central Delaware Bay. They also bring crude to Upper Jersey..
Have to have the crude - no doubt. No gas, no go. I'm concerned we have precious little in the way of response ships handy in the event of a calamity. Our "plan" in the event of emergency for this region is to do what BP did in the Gulf -- disperse it. Sink it out of sight. Mix it with chemicals and 'wash' it from the surface. Starting to look like maybe that's not such a good plan.. I'm just beginning to learn, to research. There's a lot of noise to filter about dispersants. Here's a lecture by a Ph.D. in California where he claims to have signed a document promising not to study toxicity in the #1 oil dispersant used in oil spills. At 32:44 minutes Dr. When-Chin Chun says scientists have to sign a form not to study toxicity in Corexit.. https://www.youtube.com/watch?v=nF0gPIjE6M4 The video is only a couple months old. How is it possible? Is it also true that even the US Government cannot study toxicity? I'm just beginning this study and recognize I will never understand it as a chemist or biologist might. I do not have to wonder what would happen if an enormous tanker full of crude strikes a windmill sticking hundreds of feet up. Like the lady in the 60 Minutes story says: "Don't stay & fight. Just take your family and leave." This is not the legacy I intend to leave: First we turned the deep blue sea green, then brown.